Protecting hundreds of students from intruders, kidnappers and strangers during school hours can be a difficult task when each lot of 30 student are usually under the supervision of only 1 adult teacher. Most schools or college campuses are still currently fitted with outdated or damaged CCTV surveillance cameras or do not have the right alarming solution in place. With Serious Security, our team of consultants will ensure your school’s security system is up-to-date with current security standards as well as install quality cameras so you know any criminal activity can be captured and monitored on screen. The place where kids go to learn should never be a place that compromises on safety and security. We understand the needs of schools to protect students, staff and infrastructure. We also understand the budgetary constraints faced by many schools. Our solutions consider these factors to help ensure that the school provides a safe environment so that staff and students can focus on learning. Today’s technology are ideal for the demands of schools and campuses. From single building complexes to sprawling demountables, Serious Security offers high quality, yet cost effective solutions that meets your school’s needs. 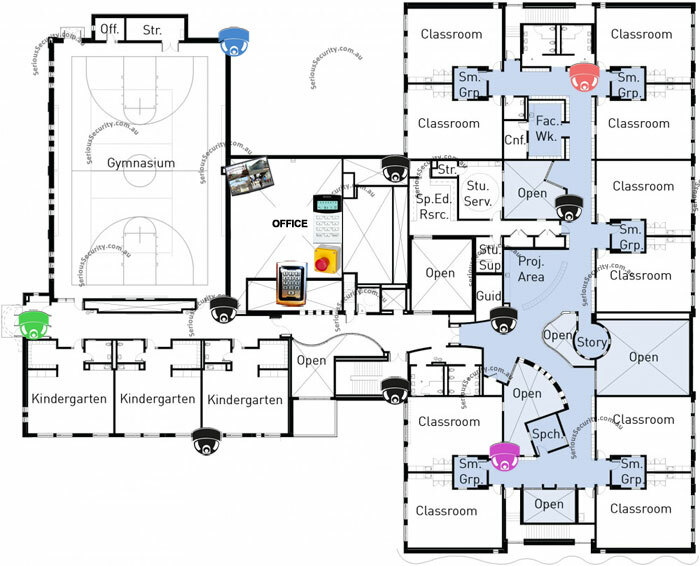 All schools have their own unique infrastructure or floor plan that may be different to other schools or colleges. We recommend an onsite evaluation to accurately determine what security system or equipment is well suited to your infrastructure. Below is a basic example of what security equipment we recommend for a local school. We recommend using 6MP+ IP cameras as they provide better clarity video images of not only the facial features of an individual, but also finer details such as number plates on cars that park within the school’s vicinity. Well positioned CCTV cameras will help capture hazards or monitor student activity within hidden areas of the school where teacher staff may not be able to supervise at all times. It will also allow head office staff to better control student restricted areas or monitor intruders from specific entrances. Common areas where cameras are usually fitted are outside classroom hallways, lunch and other activity areas, within the gate boundaries and pick up and drop off zones. Our technician will also help advise which areas of your school that would be most vulnerable to unwanted trespassing and help you position cameras in the best angle possible so your school’s management team may have the largest possible view span on difficult-to-see areas of your school’s property. Additional cameras can be added where necessary to provide the added security protection required on the school’s premises. A reliable alarm system will ensure that your school’s premise is well protected outside school hours. Ask about our mobile phone alert connection which will give the added comfort that you will be alerted should your business alarm has been set off. Our 24/7 alarm monitoring service or back to base monitoring is a direct connection to the Security Alarm Monitoring Centre (provided by our vetted monitoring partner). You benefit from an immediate response 24/7 whenever your alarm has been tampered with by intruders or if your alarm is set off from unknown reasons. You may then request a security guard to patrol the school for any suspicious activity before informing police authorities. Installing an access control pad allows you to only permit staff members from entering the back office or the storeroom where important or confidential student data are stored. This will that important documents are only accessible by school staff. Panic buttons are a great way for staff members to sound the alarm should any threatening situation arises to evacuate students from the school’s ground. The Australian Government has committed $18 million over three years from 2015-16 to 2017-18 for the new Schools Security Programme. It is designed to provide funding to government and non–government schools and preschools assessed as being at risk of attack, harassment or violence stemming from racial or religious intolerance. The Schools Security Programme uses a targeted and merit-based application process, in which state and territory governments and independent schools associations nominate schools which are then invited to apply for funding under the programme. What Your School / College Security Package Costs Could Be: (Please be advised that these packages are suitable for most small colleges or offices. Most schools will require a custom quote if your security requirements are more complex. Please call 02 8091 8008 to organise an onsite quote).